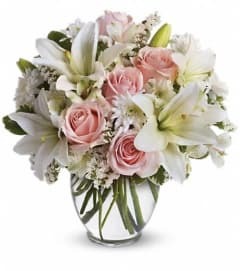 This lovely, serene bouquet makes a Zen-sational gift for any special occasion. They'll be thrilled with this artistic arrangement of orchids, lilies and exotic accents in a red bamboo dish. It's like a trip to Shangri-La. 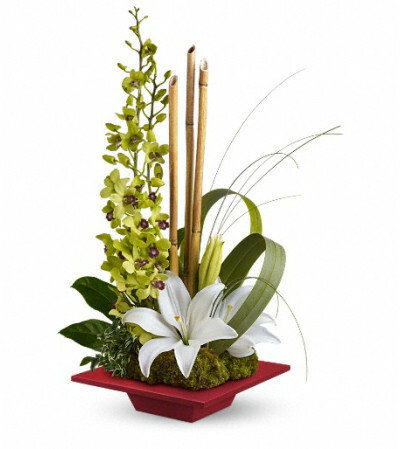 This exotic arrangement includes green dendrobium orchids, white asiatic lilies, an aralia leaf, green flax, bear grass, oregonia and mood moss accented with pieces of natural river cane. 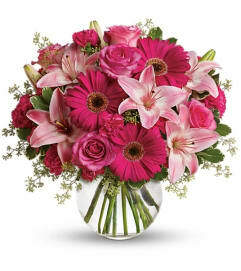 Delivered in a red bamboo dish.